Hello, everyone! For next few Saturdays, I'm going to be showing you some cool nail art with the help of It's So Easy! 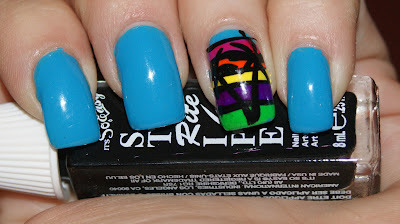 Today, I'm going to show you a design I created with the help of Stripe Rite, nail art paint with a precise striper brush. I wanted to do something that was bright and funky for summer, but that wouldn't be too over the top. So I decided to do an accent nail and looked to the old TV show, Miami Vice, for inspiration. Who does love those crazy 80's outfits, right? This was not nearly as time consuming as you might think. 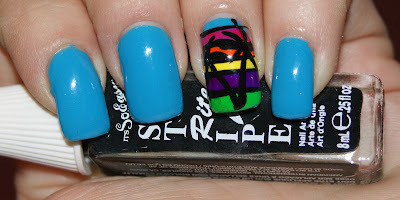 I did the stripes in different colors, all using shades of Stripe Rite. Then, I separated them with a thin black stripe. I let the stripes dry for about ten minutes before drawing on the palm tree, also with the black paint. Here, you can see how smooth the stripes dried. It wasn't bumpy to the touch or anything. The cool thing about the It’s So Easy website is that it features a Nail Art Community. Fans can upload their nail designs, regardless of experience level, and interact with others through Facebook, Pinterest and Twitter. Finger art fanatics can have their wishes granted through the It’s So Easy Product Section by creating a personalized Wish List... perfect for birthdays and holidays! Users can select from Stripe Rites, loose glitters, cracked ice, rhinestones and more, then print or email to have their list on hand when visiting their nearest It’s So Easy store location. Need inspiration? The growing How-To page offers quick and easy nail art tutorials that can be accomplished in a few easy steps. A What You Need list is available to help visitors create their desired look. Visit the website at www.itssoeasynails.com for more information on the variety of products and retailers near you. Be sure to also check out their Facebook, Instagram at @ItsSoEasyNails, Twitter, and Pinterest pages! So cute! I love the palm trees- they're really well done! Nice design! I own a few of these, but I'm actually not that pleased with them. They dry with a really odd texture and the brushes on the ones I have just don't seem to work well. I almost prefer using toothpicks as opposed to these.